2.For those devices without Bluetooth function, you can connect your device to the soundbar by a RCA AUX LINE IN, Optical, Coaxial and USB port practically every device can connect. USB-- With a USB input, so you can load up a thumb drive with your favorite tunes, leave it plugged in, and listen to them anytime. Bluetooth-- Built-in Bluetooth lets you stream music easily from your smartphone, tablet, or computer. (the range is 32ft/10m). Movie Mode: enhances the dynamic, explosive sound characteristics of modern movies. The sound bar is so versatile you can position the sound bar wherever you choose be that by the TV on a shelf or even mounted directly on the wall. 2. If no sound when connected with optical cable, please kindly switch your TV Audio Format to switching the Audio Format to 'PCM' and select Speaker from TV Speaker to Optical. 3. If there is buzzing sound/noise when connected with optical cable, please kindly set TV sound to PCM format. Slim TV Stereo Soundbar: 35-inch 2.0 channel audio, built with 4 speakers, designed to fulfill your desire for Bigger, Better Sound, sound for the most authentic home theater setup. 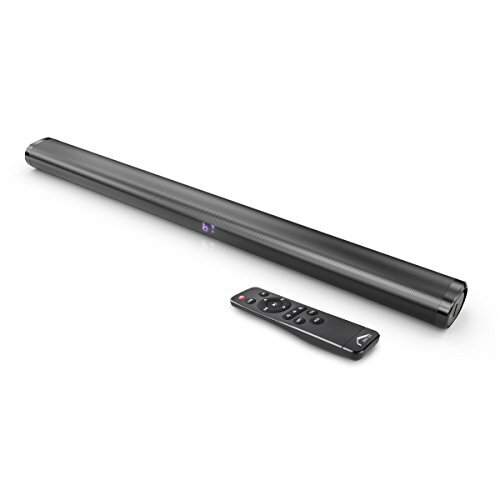 Wireless or Wired Connections: The sound bars Built with more than one way of connection (Bluetooth, AUX/RCA, Coaxial, Optical, USB Connect).For Maximum TV/Computer/Mobile Model Compatibility. 2 Audio Options: Including music and movies, providing amazing clarity and precision, it brings you a wonderful home theater experience. Easy to Setup and Operate: easy control via remote or buttons for audio volume, input and modes adjustment; mount kit provided, you can mount it on the wall or place it on the cabinet. 100% Satisfaction Guarantee- Your satisfaction is our guarantee! If you don't absolutely love your sound bars for any reasons, let us know and we'll refund your money back or send you a replacement! ORDER NOW WITH NO RISK! If you have any questions about this product by Joly Joy, contact us by completing and submitting the form below. If you are looking for a specif part number, please include it with your message.